The towels for August are based on Huck Lace. Using a design layout similar to the towels for June, this gives me a great opportunity to investigate the differences between Atwater Bronson Lace and Huck Lace. And I will also be able to investigate the differences between Huck Lace and Huck Weave (spots), which uses the same threading, but different treadling. 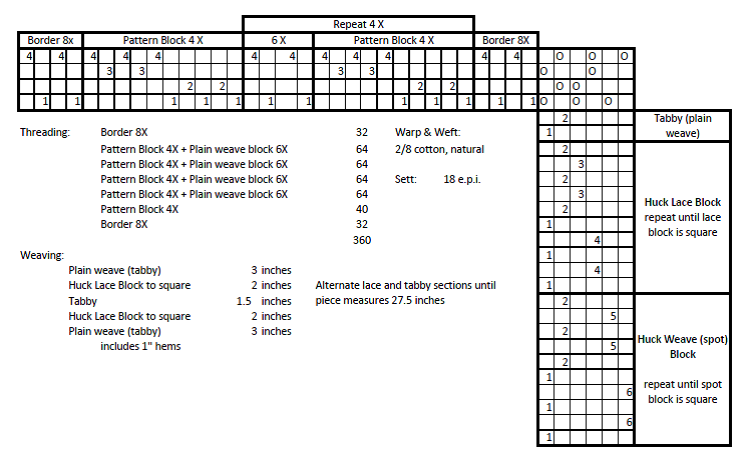 So, I will weave at least two towels, one in Huck Lace, and one in Huck Weave. I will be using good old 2/8 cotton, in natural colour, sett at 18 ends per inch. I’m having a lot of fun playing with these weaves, and the monthly deadline keeps me motivated. This entry was posted in Weaving and tagged cotton, Handweaving, huck lace, huck weave, tea towels, towel of the month, Warp, Weaving, Weft. Bookmark the permalink. I wish I was as focused and motivated as you are, with this monthly project! I just jump randomly around, from one thing to another. Your approach is better suited to learning and making progress, i think. Yes, it’s just my nature. Maybe you can teach me to be more spontaneous! So neat to see your name in the Place Des Artes Calendar of classes–you Rock Girl! !